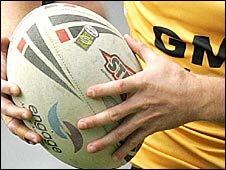 Swinton Lions have revealed they are hoping to begin building work on a new stadium in Agecroft next year. The Lions currently ground-share at Salford City Reds' stadium The Willows, but hope to move into the new £3.5m venue by April 2012. Chairman John Kidd told BBC Radio Manchester: "The stadium would be a boost, a massive boost. "It's a culmination of everything over the past six or seven years and it appears to be coming together." The Championship One side say the purpose-built stadium will have a capacity of 4,000 to 5,000 and include offices, a gym, a restaurant and conference facilities. Since leaving Station Road in 1992 Swinton have played at a number of venues including Bury football club's Gigg Lane and Park Lane, home of Sedgley Park RUFC. The Lions have made an excellent start to the Championship One season and are unbeaten after 10 games, six points clear at the top. "We're doing well on the field and now we're doing well off the field, so we're looking to capitalise on that and put a secure future down for Swinton," Kidd continued. "We've still got some obstacles to overcome and hurdles which know doubt will be put in our way but as long as we're fit enough we'll jump over them. "We've got the dominoes in a row we're just making sure we don't knock them over."